It’s a well-used word within the Protestant-evangelical community. And we have all sorts of ideas of what a pastor is, or at least should be. He’s the guy (and, yes, male only, some would say) who delivers the 45-minute homily every Sunday morning (or 50 our 52 Sundays). Or he is to make sure doctrinal purity is maintained within the church, in accordance with biblical standards. Or she’s the one who visits the sick in the hospital or home. Or he or she make the direction and vision known to the church. Or she is the one to implement different programs that the members would like to see within the church community. O, problem of all problems, the pastor functions as the CEO of a corporate-esque entity. And there are probably a host of other ideas out there. And knowing his consistent “definition” of the role and responsibility of the pastor, one can imagine this notion has seeped down deep into the heart of Peterson. I think it a beautiful summary of the pastor’s, or shepherd’s, role. 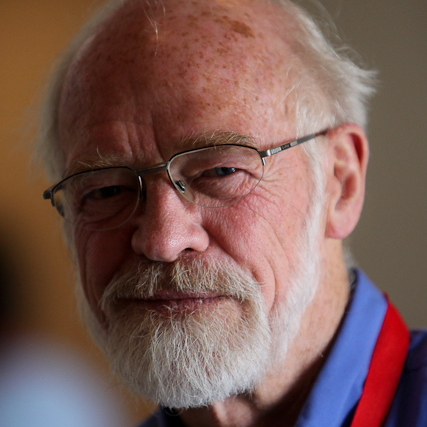 Oh, and have I ever mentioned how I love Eugene Peterson? I’m sure I have just a few times. I’ve read a few of his books and they only ever leave me wanting to read and interact more with the words of this wise and seasoned pastor. He’s someone I try and turn to once a year in order to learn from his rich journey as a pastor and practical theologian. But back to the definition. What a wonderfully focused statement about the pastor: to keep the community attentive to God. I think it is very easy to put so many expectations upon the pastor. I, myself, fell for many of them as a young pastor. Or as a perfectionist and people-pleaser, I took upon many things that I should have simply let fall to the wayside, not to mention getting distracted by a few other tasks. All of them were peanuts compared to the call of helping the sheep of the great Shepherd stay attentive to the voice of God and respond faithfully to that voice. What if every pastor focused towards this call, and that every task they did put their hands to would fall under its purview? Whether it be preaching-teaching, meeting with someone one-to-one, gathering in the home of a family, even in building relationships with those who are not yet followers of Christ. What a beautiful call to keep at the forefront of our hearts and minds. Such is a refreshing call for the pastor. This entry was tagged Eugene Peterson, pastor. Bookmark the permalink. That is a great definition of the Pastor’s role. It is so easy for me and for the congregation lose that focus. – I know my wife and I are having to teach some of our people know we can’t do it all so please don’t be offended when we say “no” to your request. P.S. I am also love Peterson. His book The Pastor should be required reading for all pastors. Haven’t read it yet, but hope to one day. I think I will read Under the Unpredictable Plant next, as it was recommended to me by another pastor friend. Really enjoyed this post. I too love that simply definition from Peterson. The goal of a pastor to turn the community’s attention toward God continues to make God the center. It points off of the pastor as the ‘head guy’ even in some sense. As a worship leader or worship pastor I think this definition suits us too. We NEED, we MUST point and keep the community attentive to God. Much can be said here. But a agree, what if every pastor made this definitely their focus? Oh the impact and intentionality it would bring. And perhaps even a sense of freedom. Freeing one’s self from the pressure of performance, appearance, or even attention. Freedom to do the call: to keep the community attentive towards God. Yes, I do think this could be a pressure-preventer: finding confidence that we are helping others become more & more attentive to God. It could be freeing, as long as we guard against perfectionism & faulting ourselves when folk choose to not pay attention to His voice. “As long as we guard ourselves when folk choose to not pay attention to His voice”. Yes, absolutely. That too can be difficult. Being the people pleaser I am, I know that right there would be a hard thought process for me. Scott these thoughts are good but I would say they miss a vital dimension – that of plurality. They still appear to assume one pastor per congregation keeping everyone attentive on God – rather than people working together both as a leadership team and as we care for one another. I think this idea can be taken even further by looking at the ‘one another’s of scripture. These indicate to me that keeping everyone attentive on God is everyone’s responsibility. I don’t believe we can abdicate this responsibility – it cannot be left to a few and certainly not to one person. I trust that these comments are helpful. Great comments. Yes, plurality of leaders! I will say, overall, I think the goal is plurality of elders-pastors, though I sometimes recognize that might not be possible. But if there are 2 or 3 elder-pastors, then maybe we could say this remains an important focus of their responsibility. Thanks for commenting! Hi Scott. I really like that idea of a primary role of a pastor being one of helping to keep the flock attentive to the Lord Jesus. However, I would say that is the role of the “average” Christian. Jesus said to let our lights so shine before men that they might glorify our Father heaven (definitely includes “being attentive”). And, I don’t think that teaching is just for pastors. That said I certainly believe that is also a role of a pastor. The responsibility of a pastor to help others be attentive to the Lord is kicked up a few notches above the “average” Christian (or has Paul might say one of no account in the church 1 Cor. 6:4). Pastors are admonished alongside other leaders with the specific task of equipping the saints for works of service. Perhaps a higher call than the “average” Christian with regard to equipping (Eph 4:12). There is some debate about that Ephesians passage as to whether pastors and teachers are separate roles or if it’s one pastor/teacher role, but either way, those men and women are held to a higher standard (i.e. : those who teach will judged more strictly James 3:1). A related issue: With our denominational structures these days, how does a mobile person go about continuously fulfilling the role of pastor? Our friend Rick Miller was an awesome pastor for years if not decades before he was officially/publicly “set in” as a pastor. I will never forget the day he and Mary were “set in” as a pastoring couple. It was beautiful, like the wedding ceremony almost. Their pastoral gifts were recognized by the church and they recognized publicly their desire to pastor the church. Having stayed in the same denomination, they remain pastors to this day. I have spent time through the years in different congregations in different denominations. I served as a teacher for decades in several congregations across multiple denominations, a deacon in a Pentecostal/Charismatic body, and as a pastor/elder at a community church. I am currently not officially recognized as fulfilling any particular role in the congregation I have now been at for more than three years. That said, Alesia and I continue to “pastor” mostly through one-to-one mentoring of younger disciples. So, in our current stations, at a new denomination for my wife and me, we continue to attempt to serve as pastors in a way that you articulate in your post, hoping to bring attention and attentiveness to the Lord. So, I guess for now I am a little “p” pastor and not a big “P” pastor. And/or perhaps I am both. Maybe “pastor at large”? Is there a medium “p” pastor? Thanks for commenting. Yes, I understand what your saying as it connects to the “priesthood of all believers.” The community of Christ is called to be an apostolic, prophetic, evangelistic, shepherding & teaching community. But there are some that bear the specific calling, as you know. And not sure we’d need to talk about big P’s and little p’s (or medium p’s). Maybe we have a) shepherds and b) the community of Christ learning to be a caring-shepherding community of one another, under the oversight of the local shepherds. And that can ebb & flow as God raises up different shepherds for different seasons. Yes, I like that. Not that it exhausts all that a shepherd of God’s flock is called to be and do, by a long way. But it’s a good start! Yes, it’s a beautiful summary. When a practitioner like Petterson speaks, you have to listen. He has earned the stripes. His memoir is a wonderful read.